carrot top chimichurri. – !dpm does! 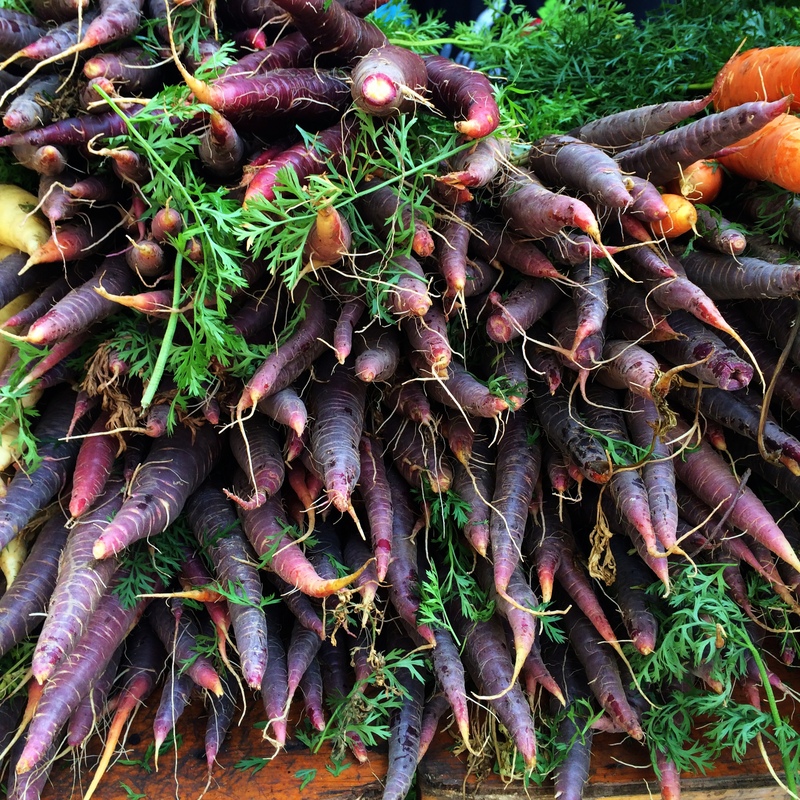 Glorious mid-August markets have us thinking about the whole vegetable these days — how to use up all the little bits of deliciousness on display Saturday mornings in McCarren Park. There’s a practical reason for this — our freezer is only so big, and can only hold so much compost over the course of a week — but also a responsible one, and we’re relishing the challenge of reusing greens and husks and peels and cores interesting ways. 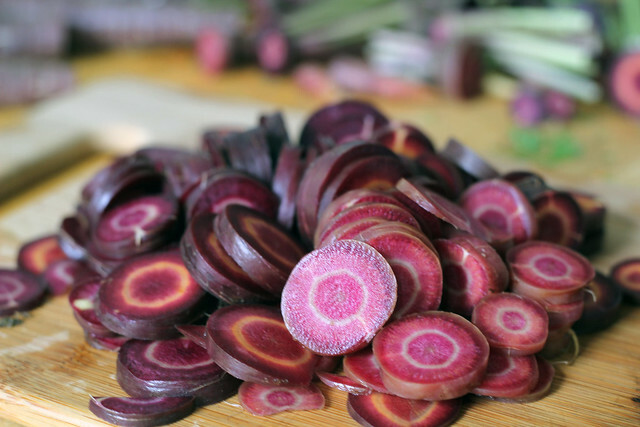 Take, for example, our most recent obsession: the sweet purple carrot. Normally. we’d ask the farmer to chop off the glorious greens before taking home a bunch. Last week, we asked her to leave them on – to the surprise of her and the nice lady awaiting her own carrot purchase to our right (and who began eying her own greens suspiciously). We asked Ms. Farmer what she suggested we do with them and she shrugged. A salad maybe? Pesto? The thing is, they taste like carrot greens. We took them home. They taste like carrot greens. Ms. Farmer said it as though it were bad thing, and as we nibbled on some leafy stalks we got what she meant. Carrot tops are, well, carroty, but more — they’re bitter. Lots of good greens are bitter though, and not one to shy away from strong characters, we decided to try them out in one of our signature preparations, yet to be featured here: chimichurri. And wow, ¡dpm! is it good. So good that once we made it through the good Argentinean protein (ahem, steak) we’d cooked up to serve with it, we took to lathering it directly on slices of toasted whole wheat bread. We imagine it would be great with all proteins, not just beef — as well as on eggs, in sandwiches, and of course, on our favorite corn empanadas. And not to worry: we didn’t forget the gorgeous roots in our quest to use the whole vegetable. Those we sliced and sauteed some chopped shallots, and a little honey and thyme. 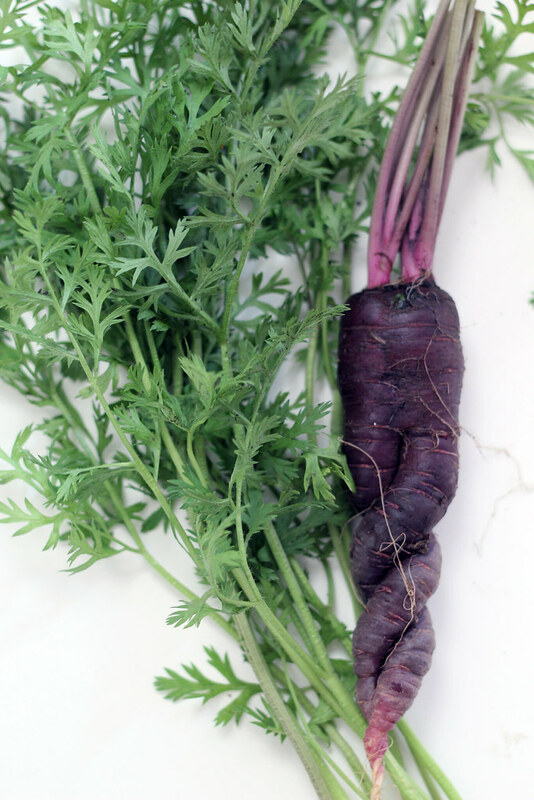 Note: a healthy bunch of carrots with their tops will yield at least two cups of chopped carrot greens, if not more. 1. Wash and dry your carrot greens well, they hold a surprising amount of dirt. 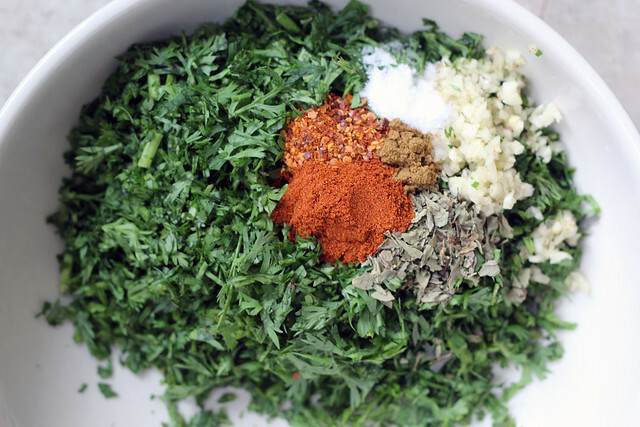 Finely chop your carrot greens and mix them with all of the dried spices and minced garlic. Stir in the vinegar and olive oil. Taste and adjust seasonings. 2. If you refrigerate before using, remove fifteen or so minutes in advance and let sit at room temperature, so the oil has time to return to its liquid form. Note: If you want to make “real” Argentine chimichurri instead, replace the carrot greens with the same amount of minced parsley, increase the garlic to two cloves and the sweet paprika to two teaspoons, and add 1/4 water, or more, until you reach the desired consistency. Previous Previous post: campari grapefruit ice pops. Next Next post: preserved lemons.